Starting your writing career late in life? You’ve got good company. Left to right: Julia Child, Laura Ingalls Wilder and Robert Frost, to name just three. I suppose I hadn’t really thought about it. I’m 56, which I know sounds pretty darned old when you’re in high school. But when it comes to writing a book, how old is “too old”? 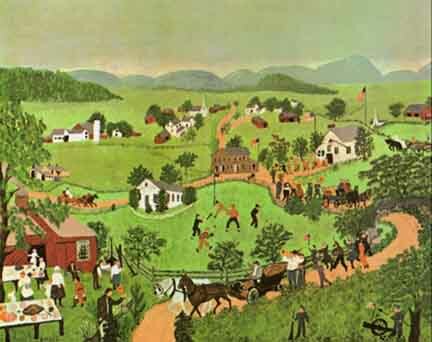 This painting — “Fourth of July” — is one of Grandma Moses’ most popular. She was 91 when she painted it! 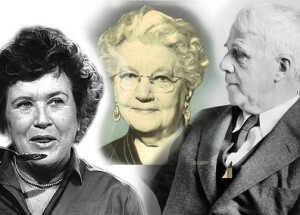 Despite science, society and Silicon Valley’s common belief that creativity, innovation and excellence are the near-exclusive province of the young, a surprising number of late bloomers dot the annals of human history — women and men who endured years of hardship, failure and missed opportunities, or who toiled in obscurity for decades before making an impact in the later stages of life. But the point here isn’t just to present myself as a spring chicken by comparison. I’m citing the article to encourage some of the others I have talked to since my book came out. Some women have wistfully commented that they have had an idea for a book just simmering about on a back burner, but they think it’s probably “too late,” somehow. If that’s you, or if you know someone like that, can I just add two words here? — Think again. If you’ve got a book idea, go for it. After all, there’s a certain woman whose books mean a lot to us who could very well have decided it was too late. But she didn’t, and millions of her fans are very glad she didn’t. It wasn’t until Laura Ingalls Wilder turned 65 that the first installment of her epic Little House on the Prairie series was published. By then, she had already devoted decades to being a farmwife and mother, schoolteacher, loan officer and newspaper columnist, and she had endured more than her fair share of hardship, from droughts to house fires. Sixty-five! Now that’s what I’m talking about. So, if you’re a late bloomer like me … grab your pen or your keyboard and start blooming! I am preparing to defend my dissertation. Once approved I am seeking an agent and beginning a rewrite for the public. In addition, in July I am beginning the research for a second book. When I think about my age (which isn’t very often, usually when someone else brings it up) I really don’t feel any different than I did at 56. This coming Christmas I will be 73. LIfe is really good! So, to all you babies in your 50’s and 60’s…write the book folks, we need to hear from you!